Bitwig proves it’s not resting on its laurels with this generous update to the already excellent DAW. Phase-4 is an instant favourite amongst Bitwig’s synths. Expanded device views are a handy workflow tool. Voice stacking is an excellent sound design tool. It’s not instantly obvious where to find all the new features and how to use them. When Bitwig Studio hit version 2 last year, it adopted a new ‘upgrade plan’ pricing scheme, whereby users purchasing or upgrading the DAW are awarded 12 months’ worth of free upgrades, but then need to buy into a further 12 month plan for access to further updates. It’s an interesting idea, but one that lives or dies on how generous Bitwig Studio is with updates. Since 2’s launch, Bitwig has offered three ‘point’ updates, each with at least a couple of new tools, and a chunk of sound pack content. Version 2.1 added an amp sim and new MIDI tools, while 2.2 brought four new modulators - including a cool Audio Rate tool that allows for creative frequency modulation - plus the Time Shift device for making micro timing tweaks. The 2.3 update is the most substantial so far though. The headline feature is Phase-4, a new four-oscillator synth based on classic phase modulation/distortion synths such as the DX7 and Casio’s CZ series. Sonically, this is similar to Bitwig’s existing FM-4, although its sound is richer, with a built-in filter and an interface that feels better designed for Bitwig’s Macros and Modulators. It’s an instant favourite among Bitwig’s current stock synths. 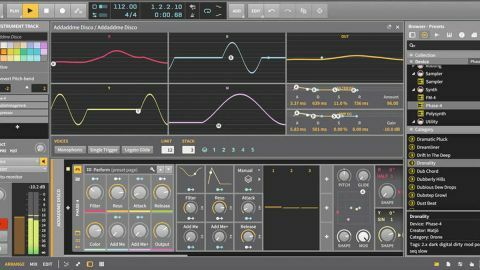 Phase-4 takes advantage of the DAW’s other major enhancement - expanded device views. This allows the workspace of several tools to ‘pop up’ and fill the main central workspace, allowing for deeper and more accurate editing, and better visual feedback. Along with the synths and sampler, this can be used with EQ-5, Spectrum Analyzer and Resonator Bank. In all cases it’s a handy UI enhancement (albeit remarkably similar to functionality already found in Ableton Live). Bitwig’s instruments also gain new Voice Stacking functionality. This is effectively an advanced unison mode, allowing multiple voices to be layered and then edited and automated independently. This is a great - if sometimes CPU-hungry - sound design tool, although it’s not always obvious how to set it up in every instrument (hint: it’s hidden in the expanded view). As Bitwig adds more deep features, a better in-DAW help system for highlighting new tools would be useful. There’s a new Voice Stack modulator too for controlling these new stacked voices’ blend. Beyond this, Bitwig 2.3 gains several new timestretch algorithms, including Zplane Elastique technology, which provides considerably more options for warping and manipulating audio. It adds the ability to automate time signature changes too, using markers to adjust the timing of individual tracks, clips or the master channel. In all this is a very generous ‘point’ update to an already excellent DAW. If Bitwig keeps updating at this pace, their free-update plan could prove to be excellent value.